Today, it is not difficult to enjoy music thanks to the invention of iPod, MP3, and smartphone. However, one of my friends – John, thinks that it is not enough for him to appreciate the classical beauty of music, so he desires to use a traditional way – a vinyl record player to listen to his favorite songs. As a newcomer to this, when asking me for help, John told me that he did not know where to start and was completely lost when researching turntables on the market. Hence, John and I decided to meet with each other to figure out the best record player under 200. 2. Can It Connect to Other Devices? Before going to the detailed reviews, we need to get familiar with some basic gramophone jargon, caring tips as well as the buying guide. Let’s get started! John had collected a lot of articles about how to buy a high-quality record player on the Internet. What he realized is that he did not understand them because of special terms which are not understandable. In fact, those words he mentioned are parts of a gramophone, so a newbie like him would found it difficult to follow. Do you feel curious about them? Even if you think you know them, let’s check whether you are right or not. Regarding kitchen gadgets, the platter is a large plate which is utilized for serving food. Despite this, the platter is a part of a record player above where the record positions and spins. It is held by something called spindle. The platter, which usually comes with a wool or rubber mat, could be made of many different materials including vinyl-coated MDF, ceramic, acrylic, glass, resin, and metal. The one and only jargon that John guessed right was ‘cartridge.’ As its name suggests, the cartridge is a small box keeping the magnets, which has responsibility for generating audio signals being transmitted to the amplification, and the needle. When it comes to the cartridge, we will have 2 primary types that are moving coil and moving magnet. The former tends to be more expensive and requires careful and regular care, but better at sounding in comparison with the latter. You can call it ‘stylus’ as well. When they use ‘needle’ or ‘stylus,’ they mean a device on a record player which looks like a small needle. It is positioned on the record to play it. The stylus is usually covered with a very tiny diamond which is shaped in different ways. The more expensive and elegant the shape is, the better it tracks around your record grooves to produce clear sounds. Otherwise, the needle is also the most delicate part, so keep your fingers away from it. To be honest, if you are not interested in classical music, you might not know what a tonearm is. In reality, this is a wand completely depending on the cartridge so that it can help the needle in tracking across your records. There is a wide range of pivoting styles, weights, sizes, and shapes regarding tonearms available on the market. The most important thing is to make sure that your tonearm and cartridge achieve synergy. Your collection will be broken in case the turntable builds up high pressure on your records. ‘Well, this term reminds me of something like ‘Fasten your seat belt before driving’ actually.’, said John. Thanks to this understanding, he would never know what a belt or direct drive is and its main function in a stereo system. A large number of hi-fi gramophones are belt driven. It has a rubber band that runs around the sub-platter or platter, and the pulley. This method is to prevent vibrations caused by the needle. Due to the belt drive, the spindle and the motor are connected so that your turntable will deliver a more consistent performance. On the contrary, with a direct drive record player, the manufacturer will connect the platter and the motor directly. Audio signals from the cartridge are very confusing. Therefore, a phono pre-amp (stage) is installed to amplify them. Cheap phono stages work with moving magnet cartridges only, whereas moving coil ones are compatible with numerous options. After digging into the meaning of terms mentioned above together, I asked John whether he knew how to look after a vinyl turntable. As you can guess, my dear friend stared at me with a blank expression on his face. Keep in mind the rule #1: Do not buy anything unless you have no idea about how to use and take care of it! Thus, in this part, I will share useful advice with you, and they are 4 things that I told my friend 2 days ago. Replace its belt when necessary. This is what you should take into consideration if you plan to have a belt driven turntable. In case you find that it slips from the pulley, it is time for you to replace the belt to bring it back the original condition. Ensure that you have a right stylus brush. You should know that the needle attracts deposits and dirt probably leading to distortion and skipping due to the static electricity generated when it is working. Hence, a stylus brush is required. In addition, after every 3,000 hours of being used, the needle ought to be replaced. Check the alignment of the anti-skate counterweight. This item is produced to make the stylus be positioned in the center of the groove when your record is spinning. Avoid any calibration errors by checking the height, anti-skate, and tracking force settings. This will prevent skipping needles and record wear so that beautiful sounds could be emitted. Never directly use your fingers to scratch or remove any parts of the turntable. Okay. Those are important notes on carrying out essential maintenance. Regular cleaning will keep your gramophone delivering great performances as well as helping it prolong its life without any huge costs. After walking through those 4 tips, John suddenly asked me about how he could find a great gramophone. To make it easier, I told him that it would be a good start by setting his budget because it ranges in price from low to very high. John quickly gave me his answer that he wanted to buy a vinyl turntable under $200. So let’s see what you should consider when choosing the best turntable under 200. Reducing vibrations or damping is what you must take into account first. This is actually to check the method which a manufacturer applies to combat vibrations internally and externally generating great sounds. Normally, they make use of various components and motor configurations to achieve this. In fact, a direct drive turntable is not likely to be as quiet as a belt-driven player that brings you higher fidelity. ‘Wow! But why do they have this difference?’, asked John. And I think you – my readers have the same question, right? Do you remember what I told you about the belt and direct drive? A belt-driven has a rubber band which runs around the sub-platter or platter, and the pulley to damp vibrations caused by the stylus. Meanwhile, the motor and the spindle are connected by the belt drive. Therefore, your turntable will have a greater performance. On the other hand, the motor and the platter are directly connected each other when it comes to a direct drive. That is the reason behind this difference. However, do not exclude the latter yet since there are plenty of good direct drive turntables on the market. In the modern world, we would love to enjoy our favorite songs on different devices, for example, our smartphone, T.V, iPod, MP3, or record player, but do you want to download the long list everytime you get a new equipment? For your convenience, make sure that your turntable can connect with speakers, or a computer via Bluetooth or a USB output to rip records. To be honest, buying a vinyl record player heavily depends on your personal needs apart from the 2 factors mentioned above. Nevertheless, I strongly advised John and you not to go for a complex system as you are newcomers to this field. Also, they are usually luxury options offered at a high price. Due to a wide range of turntables available in the market, we had spent hours on looking for top 5 products that could meet his requirements. Thus, I also want to share my detailed reviews to help you get your best record player under 200 easily. The first one that we chose was a Victrola turntable from Innovative Technology. This record player comes with 5 different colors for consumers to choose depending on your interior decor – black, espresso, oak, white and mahogany. Also, the Innovative Technology gramophone offers you 3 speeds which are 33 1/3, 45, and 78 RPM to play your favorite albums and vinyl records. Interestingly, users can directly record from cassettes, CDs, and records thanks to the USB. This process requires no software or computer. As you can see, this record player is called 8-in-1 entertainment center, right? The Bluetooth capability allows it to stream music up to 33 feet away wirelessly. To play music from all non-Bluetooth device, the manufacturer has built a 3.5mm aux-in, AM/FM radio, USB player, cassette player, and CD player inside the turntable with a headphone input. To provide you an enjoyable experience, a remote control is also supplied with the player, so you do not need to move around for adjustment. Also, you will receive 3 replacement needles, a 1GB USB drive as well as a cleaning cloth so that consumers do not have to buy these things separately. In spite of these considerable advantages, John and I saw that their remote control does not have ON/OFF button. Furthermore, the real colors are darker in comparison with the one in photos. The second candidate for the best record player under 200 was 1byone Belt Driven Vintage Record Player. There are 2 colors for you to choose – black and natural wood. The former will be suitable for the modern taste while the latter tends to match the classic style. Overall, the design is a balance of mid-century charm and modernity. To prevent the damage of dust particles to your turntable, 1byone has installed a transparent cover to protect the device after each use. Otherwise, it has three selectable speeds which are 33, 35, and 78 RPM. The vinyl-to-MP3 recording allows consumers to convert vinyl records into MP3 format to save them on an MP3 player. A full stereo speaker system is built inside the gramophone to generate optimized sounds with great clarity. Additionally, this record player is compatible with many devices such as MP3 player, USB, PC, tablet, smartphone, Android, iPhone, and so on. However, this 1byone turntable is quite big that takes a quite large space to store. Likewise, the internal speakers are a bit weak. The next record player is Electrohome Retro Vinyl Turntable Real Wood Stereo System. The first impression of this was favorable because of the combination of the old-school style with modern technologies to help music enthusiasts enjoy high-quality sounds like 100 years ago. You can enjoy your favorite albums on vinyl records, AM/FM radio or CDs thanks to the tuning dial. The 3.5mm auxiliary or USB input allows turntable to play MP3 files on different devices, for instance, tablet, smartphone, iPad, iPhone, and so on. Similar to the previous models, Electrohome Retro Vinyl Turntable provides customers with three-speed settings – 33 1/3, 45, and 78 RPM. Also, this could play different vinyl records – 7, 10, and 12 inches to offer you a wider range of options. In case you want a private listening, just connect your headphones. The stereo speakers are installed in a wood cabinet to produce rich and room-filling impact with optimal performance. It has a USB port so that you can record vinyl albums to MP3 with one press only. The stylus, which is tipped with ceramic, is specially designed to be in the shape of a cone to bring the audience the great audio quality with natural and warm tone. That will satisfy you even if they are the most cherished songs. Nevertheless, we found that the player seemed to be quite loose. Sometimes, it might skip a lot even when the record is still in good condition. Another product which could be considered as the best record player under 200 is Audio-Technica Belt Drive Stereo Turntable AT-LP60BK-BT. If you are interested in this field, you will realize that Audio-Technica is one of the leading brands in the design and manufacture of audio products that was founded in 1962. Due to the Bluetooth wireless technology, the AT-LP60BK-BT model can wirelessly connect to speakers as well as other common devices. Regarding powered speakers and wired audio systems, the manufacturer provided you the dual RCA output cable. This is a fully automatic record player with 2-speed settings – 33 1/1 and 45 RPM. To deliver higher fidelity and excellent sounds, Audio-Technica has equipped their product with a die-cast aluminum and anti-resonance platter. Otherwise, the replaceable needle is produced so that users can remove and replace it easily when necessary. This product comes with a removable dust cover, 3.5mm mini plug, dual RCA output cable, and 45 RPM adapter. Their turntable is available in 3 different colors – navy, white and black. On the minus side, while the needle is removable, the cartridge is not replaceable which is firmly stuck to the arm. The last turntable that John and I picked is also from a big name – Crosley. Their first record player was launched in 1992. The company is named after Powell Crosley – a man living in the 1920s who made a radio for people. With the installed Bluetooth receiver, you can stream the digital music from your smartphone via speakers of the turntable. This belt-driven player has 3-speed settings in total – 33 1/3, 45, and 78 RPM. The built-in cassette player allows the audience to listen to their mixtapes. Moreover, you can listen to music on your CDs and AM/FM radio thanks to the airplane tuning dial. The biggest problem of Crosley 3-Speed Turntable CR704D-PA is the letters on buttons. They are very small and written in black. As a result, users will find it quite difficult to read and use the initial use. After doing very detailed reviews and comparing 5 turntables with each other, John decided to purchase Audio-Technica Belt Drive Stereo Turntable AT-LP60BK-BT. This is a user-friendly turntable, which is suitable for a newbie like him. Also, the record player supports him in connecting with both wireless and wired devices thanks to the Bluetooth wireless technology and dual RCA output cable. Regarding the quality of sounds, this model is well equipped with a die-cast aluminum and anti-resonance platter. Hence, it can provide him with a more consistent performance and clearer sounds. Importantly, the turntable has a dust cover so that John will not need to do daily maintenance but improve the level of durability. 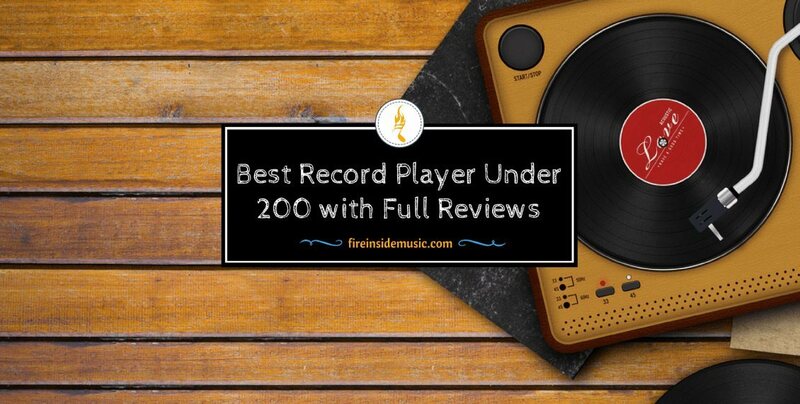 Hope that our story made you feel easier to find the best record player under 200 for your own. If you have any questions, leave a comment. Last, do not wait to like and share article today with your friends.